When Wardah Inam was getting her doctorate in electrical engineering and computer science at MIT, she grew annoyed that she couldn’t easily transport her phone, wallet, keys, and ID between her lab and office. The quick trips didn’t require a bag, but the small pockets in her jeans couldn’t accommodate the items. She complained to her husband, Ahmed Malik, wondering aloud why women’s jean pockets couldn’t fulfill their function. Malik, who had grown up working in his family’s textile factory in Lahore, Pakistan, was skeptical: Were pockets really an issue women cared about? It turns out the answer was a vehement yes. The fashion industry is awash in pointless pockets, like the ones stitched onto pajama tops or into the pants of infants. But Malik’s market research found that few issues draw women’s ire as much as the lack of functional pockets in pants. On average, the pockets in women’s jeans are 48 percent shorter and 6.5 percent narrower than men’s, according to a comparison done by journalists at the data-driven culture site The Pudding. “You can’t even cram an average woman’s hand beyond the knuckles into the majority of women’s front pockets,” they wrote. The couple recruited a fashion industry veteran, Richard Lowe III, as creative director. Lowe had helped develop Spiegel’s Shape FX technology, which uses compression fabrics to create flattering garments. 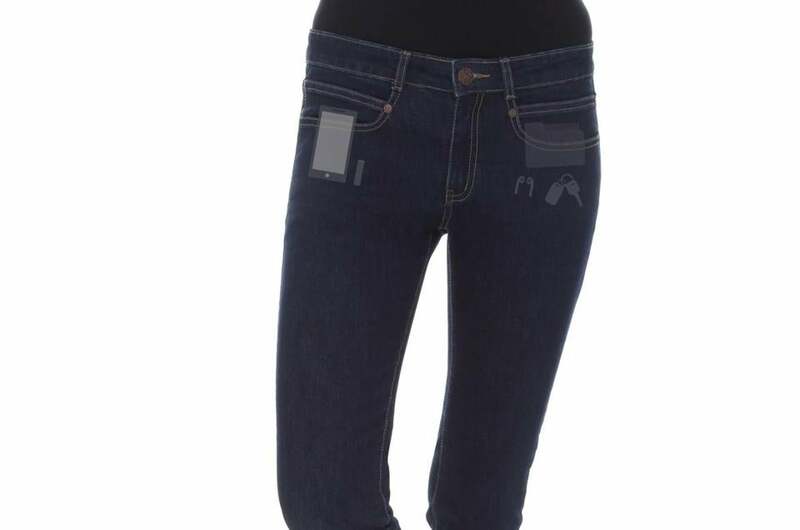 Together, they developed a line of jeans with front pockets that can accommodate a phone, wallet, and other essentials. The pants also have four-way stretch for comfort and fit, rear flaps to keep items from falling out of back pockets, and on all but the black jeans, Coolmax, a technology to moderate a wearer’s temperature in cold or warm weather. A version in white even has stain-resistant coating, which allow spills to wipe off easily. And pairs can be custom fit, for a bump in price. The company launched a Kickstarter in December, and quickly blew past its $15,000 goal. At press time, it’d raised over $230,000 from more than 2,400 backers, which is more than enough to start production, Malik says. He plans to start shipping the pants in the spring.